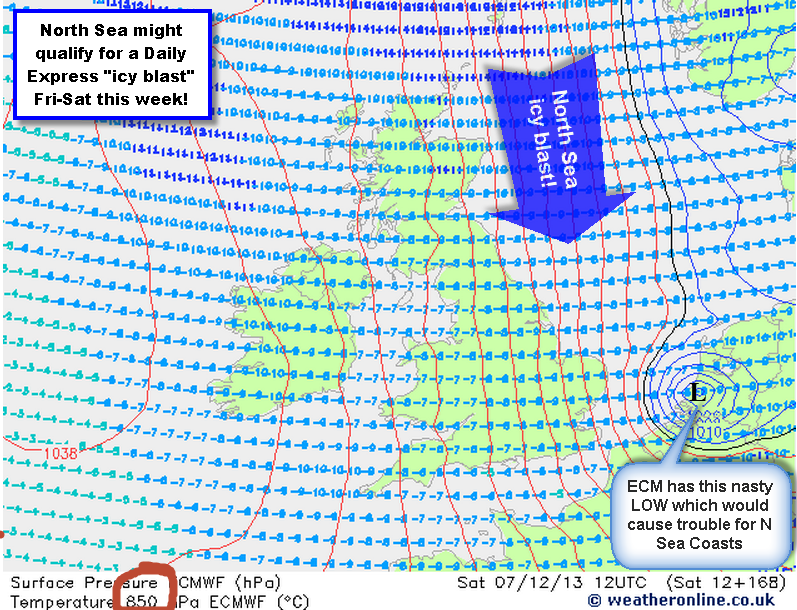 “Express icy blast”… but this time it really might be chilly for a while! lunchtime Friday… get a coffee! STORM SURGE WARNING FOR NORTH SEA COASTS WIND and North Sea storm surge update later today: check twitter @RGSweather for updates! Point to note: the original weather forecast (below) for Thurs-Sat dec5-7 emphasised a plunge of cold Arctic air on the back of the low passing across N Sea. However, in the event, as things quickly transpired nearer the time the strong northerly winds became the focus and the storm surge down the east coast on the back of it. 528 dam (coldest air) stayed well to the east of the SE and so we had squally showers on the cold front with no wintry ppt. Express meaning rapid / short-lived icy blast for later this week is firming up in most model runs now, though with differences in arrival, departure and intensity (especially the GFS which is least chilly, but I understand this is not deemed as performing well on this event). 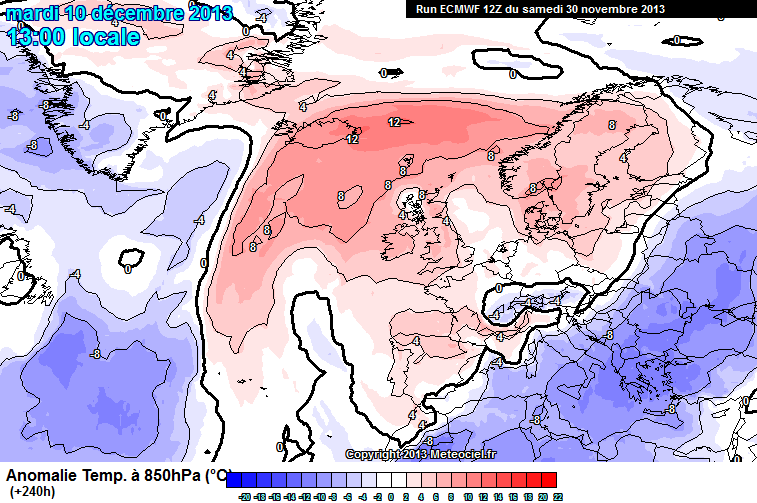 Anyhow, it would be sensible to assume that it will be chilly or cold to very cold for early December across much of the UK from Thursday onward and through much of next weekend with the North and coastal areas, especially North Sea coasts, getting some really icy gales at times, particularly Thurs-Fri/Sat. 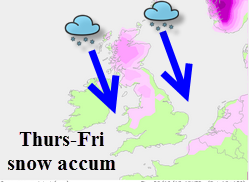 Some snow is likely for north facing coasts both East and West and Scotland and parts of Northern England. Reigate and the more sheltered SE will, as usual, be protected from the worst but we can still expect cold blustery conditions at times with such a cold upper Arctic airmass incursion. Air mass temps are usually measured at 5000ft (850hPa) (to avoid surface interference and changes day/night, urban/rural etc above the so-called boundary layer). 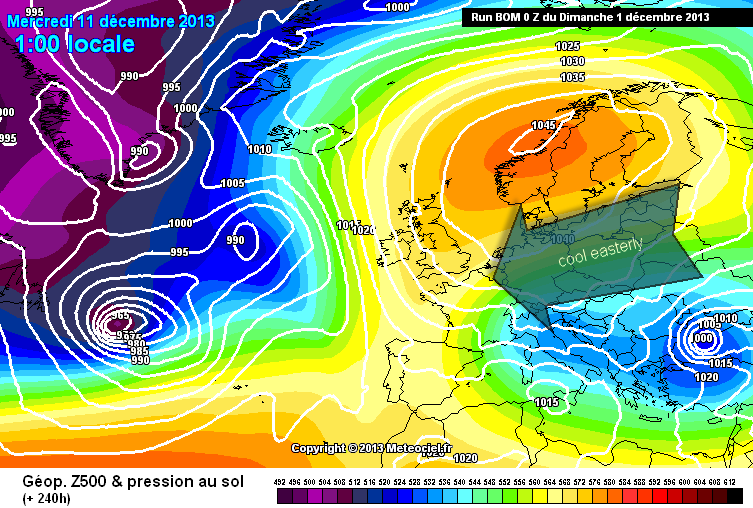 Currently our 850hPa temp is around 0c, by the end of this week they will drop to -8c or even -10c. Include the wind expected, especially Thursday – Friday and this will feel cold if you are out and about, watching football matches on the touchline for example: much colder than this weekend! Air temps may struggle to reach 2-3c in Reigate on Friday and the 15-20mph wind will make it feel well below freezing. An interesting additional feature is a possible LOW forming in the southern part of the North Sea on those icy northerly gales. If this occurs it might bring snow to the far SE of the UK and certainly into Netherlands and, later, the rest of N Europe. 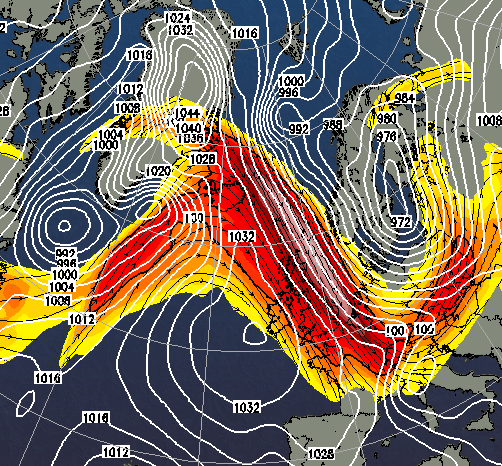 The culprit is the jetstream which is looping wildly around the Northern hemisphere at present. The jetstream acts as a kind of “belt” around the Poles holding the cold Arctic air in. If the jet starts weakening and wiggling from North-South it allows cold air to leak out from the Poles and plunge south in huge swoops of icy air. The Arctic swoop expected later next week is going to inject icy weather to much of Europe from Greenland and the North Pole The UK, being on the western edge of this swoop, will miss the most intense cold (that’ll hit Netherlands and Germany and, eventually, get as far as E Europe and the Alps). The lead-up to this event is pretty benign with a high pressure giving calm cool cloudy conditions early in the week, turning into a more westerly zonal flow for a time before the northerly plunge hits from Thursday. More on this later in the week as more details emerge. 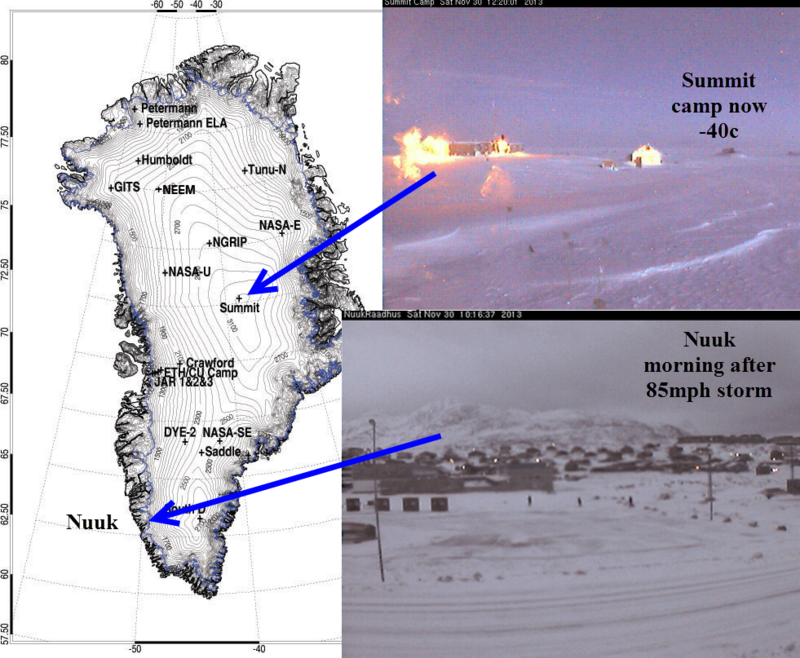 A current picture of Greenland shows conditions this weekend. Think of air leaving here this week and reaching the UK by Thursday: thankfully, it’ll warm up from around -40c on the ice sheet to about +4c by the time it reaches Reigate high street.